Hi, my name is MISSY and I am a EIGHTEEN MONTH old female LABRADOR MIX weighing 50 pounds. Not to brag, but I’m a real stunner with my slim figure and lush black coat and white chest that you won’t be able to resist caressing. . I’m excited for my future and finding my forever home, but let me briefly fill you in about my past. I was found wandering in a desert and rescued in Texas, when I was 6 months old. I moved to New York, became a Posh Pet, and have been given the love I never knew before to help prepare me for my forever home. I still get a bit nervous with sudden movements or loud noises; I never knew what made noises in the desert. 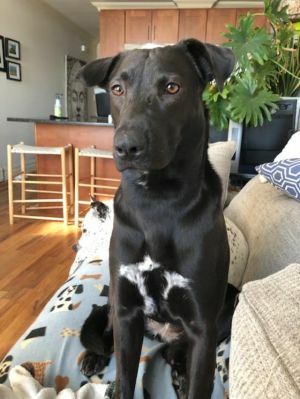 My foster home has other dogs who have been really helpful in teaching me how to be a wonderful pet and in building my confidence, so a home with ANOTHER DOG would be best for me. I happily share my human, gently take treats, and love to go for walks with my other dog friends (even the bossy ones- watch my video!). . Once I know you, you’ll see how much I love spending time with you and letting you love me. You’ll be so glad you welcomed me into your family. As they say, “to know me is to love me.” I’m spayed, up to date on vaccinations, and microchipped.